Even before the indomitable Susan B. Anthony got women officially admitted to the University of Rochester in 1900, the equally determined Martha Matilda Harper was (unofficially) already attending classes on campus. It was one of the ways she was preparing for an extraordinary entrepreneurial career undertaken at a time when women just didn't do such things. Harper's tresses were both her inspiration and her most enduring publicity tool. If Horatio Alger had been writing stories for girls, she could have been his heroine. Tough, smart, and endowed with uncommon business acumen, Martha Matilda Harper entered the world of work at the tender age of seven. Half a century later, at the height of her career, she was presiding over a global business that included the rich and powerful--socialites, theatrical celebrities, presidents, and first ladies--among its devoted clientele. 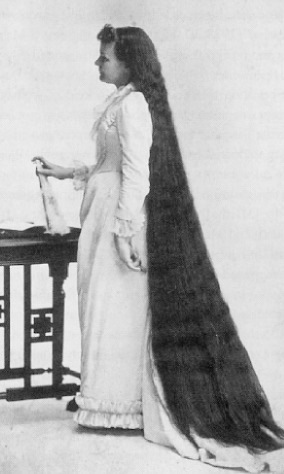 And, in an ingenious twist on the Rapunzel legend, she did it all with the assist of her most noteworthy physical attribute--the luxurious mane of floor-length chestnut hair that was both her inspiration and her most enduring publicity tool. P. T. Barnum tried, in vain, to sign her up for his circus, where she could have made her fortune simply by displaying her "phenomenal tresses." Instead, this former servant girl used her crowning glory as a means of pulling herself out of the confines of class and poverty--and along the way changed the way the world does business, affirmed the right of women to control their economic destiny, and, not so incidentally, altered the way we look at "beauty." In her new biography, Martha Matilda Harper and the American Dream (Syracuse University Press), Jane Plitt, an associate in the University's Anthony Center for Women's Leadership and a successful businesswoman in her own right, has uncovered the forgotten tale of this feminist entrepreneur who in the late 19th and early 20th centuries built a worldwide network of Harper Method hair salons. Harper's "Method" was a health-conscious salon experience embraced by the social elite. Using scientific techniques and applications, salon operators sought to bring out the inner beauty of customers by promoting healthy skin and hair, and by reducing the stress of everyday living; neck, shoulder, and head massages were part of the package. Harper was the first to coax wealthy women out of their homes to have their hair done--no small feat during the Victorian era. Her salons were all about customer comfort: private, serene surroundings; professional attendants trained in scientific methods; all-natural beauty products that would be at home in today's trendiest salons. She even invented the salon recliner chair with neck support in the sink (but failed to patent it). Further, when she sought to expand her business from her original solo shop, Harper invented--more than half a century before Ray Kroc launched McDonald's--a franchise system of satellite operations that duplicated in every respect her original shop, products, and training. Writes Plitt: "Each Harper shop was a refuge: immaculate, orderly, full only of Harper products, and offering extraordinary and painstaking service. . . . Martha's salons became havens for refreshment, since Harper shampoos included a head and shoulder massage to stimulate blood flow." Facials, she notes, also were offered. And Martha instructed her salon operators "that they themselves had to be 'peaceful and happy' in order to induce similar feelings in their customers." Harper's focus on pampering the customer became the industry standard. Harper Method graduates, trained in the company's popular schools, were eagerly sought by her competitors. "You always wanted to hire a Harper trainee," Plitt says, "because they learned the scientific methods and applications, as well as customer focus." At its apex in the early 1930s, the Rochester-based Harper network could boast more than 500 salons in cities around the globe. Seventy years later Martha Matilda Harper is virtually forgotten, her memory kept alive only by the last two surviving salons. Her achievement, Plitt says, slipped through the cracks of history because she was a woman who succeeded in a man's world, and did it on her own, feminist terms. "It struck me that allowing Martha Matilda Harper's story to vanish was a metaphor for how undervalued women's lives have been in our society," Plitt says. When I started researching this story, I never imagined that the Harper Method was as significant an international enterprise as it turned out to be. This was a huge, huge enterprise." Harper's success couldn't have happened without the pioneering spirit of her school's graduates, many of whom moved to open shops in distant cities where they knew no one. Salon owners, known as Harperites, were women who aimed for a better life and were willing to work hard to get it. Plitt's book includes the recollections of a New York City shop owner during the 1930s: "We started for the big city with . . . determination (which no one thought I had). At last our first customer entered. . . . Such joy! . . . Let [Miss Harper's] heart rejoice, knowing her girls love her and appreciate what she has done for womanhood." Harper herself set the bar for her franchise owners. Born in Canada, she was bound out by her parents as a household servant (to her own aunt and uncle!) at age seven. Later she went to work for a kindly physician interested in the physiology of hair who invented a secret formula to promote its growth. Sensing a similar interest on Martha's part, he began sharing his knowledge, and eventually his formula. In 1882, at age 25, still as a domestic servant, Harper headed south to Rochester to seek new opportunity, "holding a knotted handkerchief with sixty hard-earned silver dollars and the formula wrapped inside." She took a job with a family who lived in a mansion on East Main Street (where the Auditorium Theater now stands). Within a year, that family left her behind when they moved, and Harper ("as if she were part of the real estate," Plitt writes) remained to work 14-hour days for the next owners, meanwhile taking the first steps toward starting her own business. Manufacturing her hair tonic in a backyard shed, Harper began using it on herself (with spectacular results) and practicing on a growing clientele among her mistress's friends. In 1888, Martha Matilda Harper opened her first shop, in the finest and fanciest commercial building in downtown Rochester--this after having to convince the landlord that her establishment would not be an attraction for "trollops and prostitutes." When a music teacher rented a small studio next door, Harper cannily offered her salon as a waiting room for his pupils' mothers, who soon began whiling away the time by getting their hair done. That Harper's business did not long remain a single, one-woman shop can be attributed in some good measure to her religious faith. Shortly after arriving in Rochester she had joined the Christian Science Church, a belief system that embraced women as strong, equal members of society, even leaders. It was a philosophy that appealed to Harper, who throughout her life believed that women could achieve whatever they wanted if they were willing to work hard, and she preached this repeatedly to "her girls" in her company newsletter. "With a charisma equal to any magnetic leader, Martha enlarged her organization by converting ordinary women into proud businesswomen," Plitt writes. She accomplished this through idea-sharing among franchise owners and regular get-togethers, even as her network of shops grew into the hundreds. Harper's "commitment to mindfulness, good health, and kindly interaction among people reflected how Christian Science continued to influence her business dealings and philosophy." She gave salon operators time off during the day to take care of responsibilities outside of work. She provided production and performance incentives, and she helped them become business owners. Just how strongly Harper believed in helping women succeed comes through in a message to salon operators in a 1926 company newsletter: "I believe that the Great Achievement of the Harper Method does not consist of the large number of our shops--though the sun never sets on them. . . . The Great Achievement of the Harper empire is the women it has made." "The moment I read that, my hands shook and I really fell in love with Martha," Plitt says. "Those words acknowledged the whole point. This was giving women power to do as they wanted with their lives." Harper encouraged them to throw off old habits of "I can't" and "I shouldn't." Anything was possible, a forbidden notion in a time when pride and self-determination were not the accepted traits of a lady. Not surprisingly, suffragists and their sympathizers applauded her vision and frequented her shops--among them Anthony herself, although for the silver-haired suffragist, Plitt writes, "the focus was on the healthful treatments, not on the styling." Plitt stumbled upon Harper's story in 1994 while doing research for her business consulting company, and couldn't get her out of her mind. A couple of years later, she closed her 20-year-old business to pursue the story full time. For help with her investigations, Plitt turned to the University's Anthony Center, a flourishing Rochester program exemplifying the kind of work being carried on in Anthony's name at the university she helped open to women 100 years ago this fall. The center offered Plitt an appointment as a visiting scholar, which, she says, "played a critical role" in helping her gain access to research materials in the University's own library and other research centers. Plitt's quest also took her out on the road, on a journey across the Midwest, down to Florida, and into Canada. It was the writer's own schooling in the no-nonsense, "get your hands dirty and work hard" Harper Method: A phone call to former Harperite Betty Wheeler confirmed that she had several boxes of company documents at her home in Viola, Wisconsin. When Plitt asked if she would be able to take some materials to the local Kinko's to make copies, Wheeler told her, "There is no Kinko's in Viola, Wisconsin. You'll have to bring your own copier." And so she did. Rolling along in her portable office, Plitt met dozens of people who had either known Harper or her husband, Robert McBain (who liked to be known as "the Captain"), or were part of her family or business. Over tea with the Captain's niece, Fausta Ahrens, in Eagle Grove, Iowa, Plitt learned more about the man Harper chose to marry at the age of 63. (He was 39.) In Viola, Betty Wheeler and her husband, Warren, shared their memories of working with Harper. And in Iowa, she stayed with the Captain's great-nephew, who in a quiet but persistent way kept asking if she wouldn't like to go see the land where the Captain grew up. It was a four-hour drive away. "He kept saying, 'You don't want to see the land?' I didn't really want to go, but finally I said I would. That turned out to be a transforming experience. I learned you do need a sense of land, of earth, of surroundings, to understand the story. I learned not to prejudge what was important or not. As people led me, I followed." The loyalty Harperites felt for their founder still runs deep, she reports. One woman told Plitt she stores letters associated with the Harpers in a locked wooden container that she whisks to the basement every time a tornado threatens. The Wheelers of Viola, Wisconsin, took all of their boxes of Harper Method documents with them each of the four times they moved. "When I interviewed those women, I found so much pride in being associated with this method," she recalls. "That means something. A lot of corporations today would give their right hand to have that kind of loyalty and support from their employees." Enormously successful though she was, Harper made two key mistakes with her business, Plitt says. One was her failure to patent the reclining chair, now a fixture in salons worldwide. The other mistake contributed to the company's ultimate demise: her failure to create a succession plan. "When she became too old to run the company, Harper passed the reins to her husband. The Captain, and the men he left in charge, couldn't provide the woman-to-woman, "You can do it!" inspiration that was Harper's signature. Furthermore, they chose a deadly "me-too" marketing approach, abandoning the Method's unique mark as science-based and healthful, in favor of the beauty-in-a-jar approach of their competitors. Harper died in 1950, at nearly 93, and was buried in Rochester's Riverside Cemetery. After her husband died in 1965, the business continued under a variety of owners until 1972. A wily competitor bought the training academy and shut its doors, thus closing off the network's only source of talent. Amazingly, two salons remain open, but only one of them, the Harper Method Founders Shop owned by Centa Sailer in Rochester, is still taking new customers. "Martha was brilliant, humanistic, using business for social change," Plitt says, "and what do we do? We bury her. And that is why I did this story, because she's an extraordinary role model for men and women, boys and girls. Those are the kinds of stories we need to build on. I hope that Martha's story inspires a greater openness in our society to new ideas, even if they're proposed by nontraditional teachers. "There should never be any doubt about who Martha Matilda Harper was." Sally Parker is a Rochester-based freelance writer.